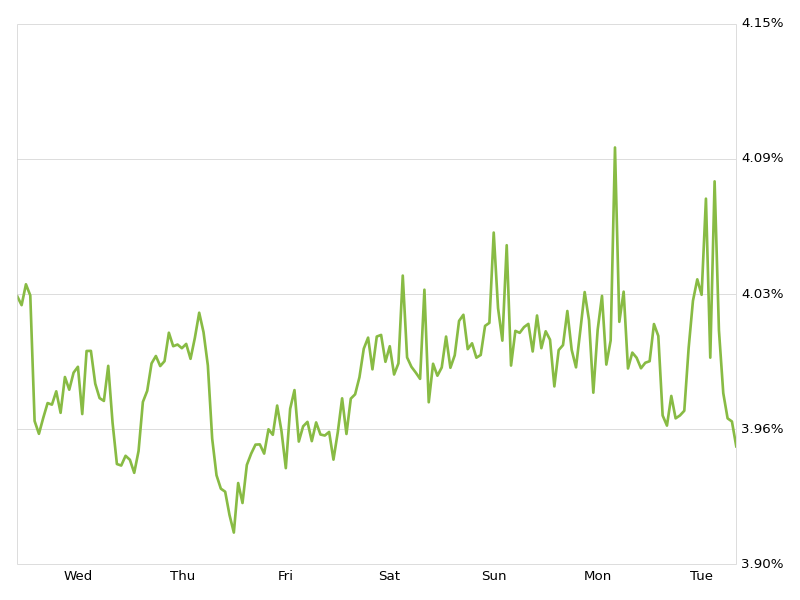 Mortgage rates for 30-year fixed mortgages fell 12 basis points this week, with the current rate borrowers were quoted on Zillow Mortgages at 3.96 percent, down from 4.08 percent at this same time last week. The 30-year fixed mortgage rate hovered around 4 percent for most of last week, peaking at 4.09 percent on Monday before easing back down to the current rate on Tuesday. "Mortgage rates stayed below 4 percent for much of last week on news of a potential European Central Bank plan to implement a stimulus program similar to the Federal Reserve's that has kept rates low in the U.S.," said Erin Lantz, vice president of mortgages at Zillow. "We expect rates to remain flat in this holiday-shortened week, as any bright spots in domestic economic data will likely be overshadowed by concerns about the European economy." Purchase Mortgage Application Activity: Zillow predicts tomorrow's seasonally adjusted Mortgage Bankers Association Weekly Application Index will show purchase loan activity increased by 4 percent from the week prior. To learn more about this Zillow analysis, click here.